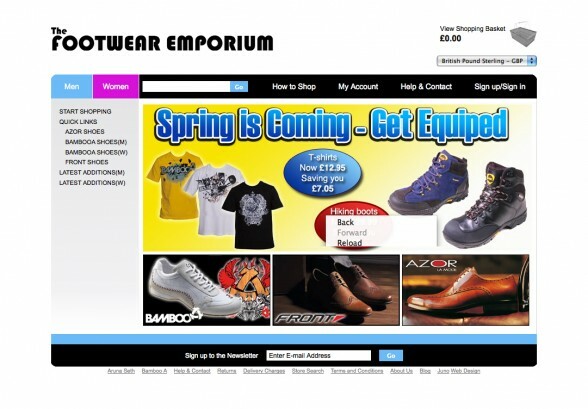 With Web Design provided by Craig at Footwear Emporium we have built a powerful Magento driven Ecommerce platform fine tuned to sell and manage the Footwear Emporium product range. The website includes extensive product filtering functionality to ensure users are put in touch with relevant products as quickly as possible encouraging sales. Built this way the website is best placed for search engine performance long term. The beauty of the system is its agile functionality and ability to achieve great traffic, facilitating sales. Simple intuitive product management functionality means that addition and maintenance is ‘a doddle’ and stock levels, sales figures and invoicing is handled efficiently. Also Key to the success of this site is the way the products are represented. Photography and product images are rich throughout the site. Easy to use navigation will conduct users to the point of purchase as quickly and easily as possible. All unnecessary barriers to purchase have been removed. In reality Footwear emporium have a wealth of functionality at their disposal and much more can be turned on should they require it, for example if they wish to sell in foreign markets. Find out more about our magento web design services here.